It’s easy to become overwhelmed by the pure volume of groomsman gift options available, most of which have been sorely overdone. Here’s looking at you, watches and flasks. Your wedding party members have always supported you and will stand beside you on your big day. Instead of thanking them with something they’ll end up using as a doorstop or hiding on a shelf, consider one of these 10 uncommon gift ideas available on Etsy. 1. Engraved 1 Liter Bourbon Cask, $57.95. We may have saved the best for last. 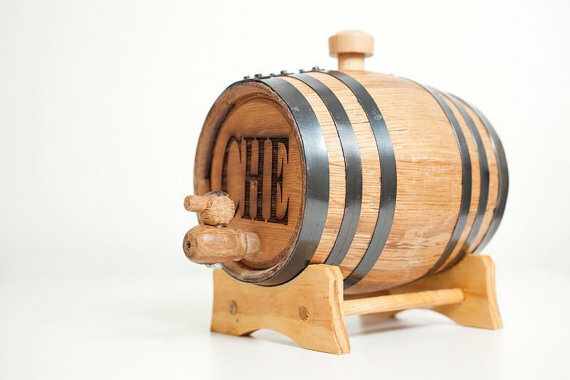 These mini bourbon aging barrels are as legit as they get. They’re designed so the novice distiller can create his own blend of bourbon using store-bought ingredients. Available in three sizes with free engraving included. 2. Handmade Leather Razor Bag, $38. Men who accessorize with leather always look more distinguished. These handsome bags will reinforce that statement. He’ll travel in style with his own personalized razor bag that’s designed to be used separately from a standard toiletry bag. His razors, shave cream and aftershave will now have their own storage place where they won’t rub up against his toothbrush, contact lens case and other bathroom necessities. 3. 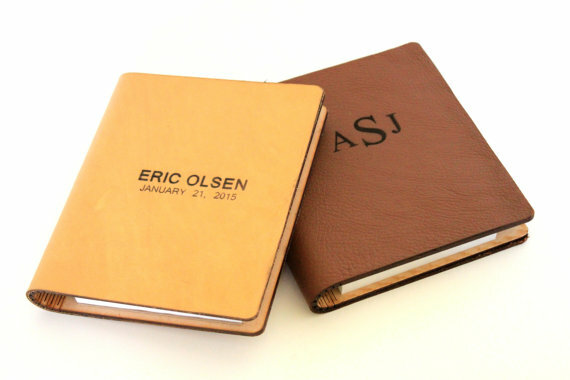 Personalized Leather Journals, $21.95. Are your groomsmen full of great ideas or hot air? Either way, they’ll be able to catalog their thoughts in these sharp looking leather journals. Add a set of initials or name to the front for no extra charge. 4. Engraved Beer Flight Tasting Paddle, $39.95. 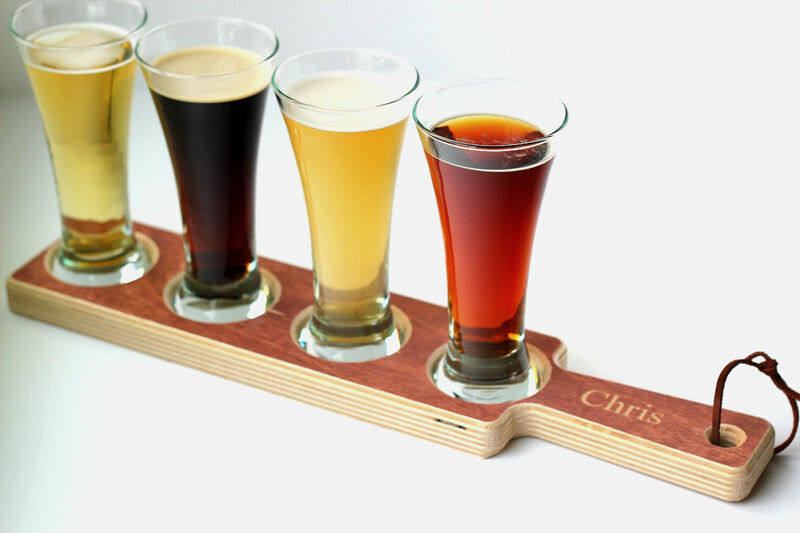 Line up your favorite brews and stage your own beer tasting with this paddle crafted from reclaimed red oak. The set comes with four mini pilsner glasses and features a leather hanging strap for easy storage on the wall or behind a bar. 5. Engraved Cigar Box, $28. Planning on lighting up some stogies with your best man and groomsmen on the wedding day? 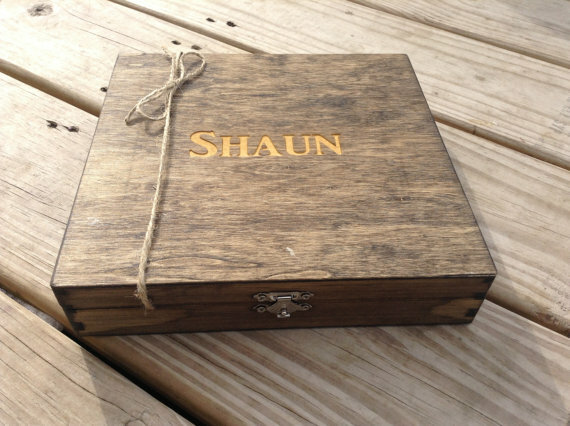 There’s no better gift for your crew than this rustic, walnut-colored cigar box. The box will hold around six to seven cigars and offers a personalized memory of the big day. 6. 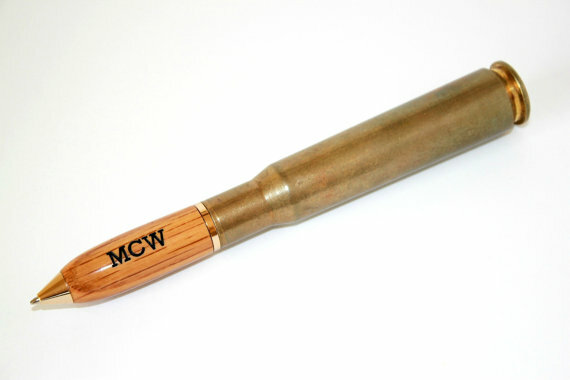 Whiskey Barrel/Machine Gun Bullet Pen, $66.95. This unique pen is perfect for the man who has many leather-bound books and whose home smells of rich mahogany. The robust pen is half whiskey barrel (your choice of Jack Daniels or Jim Beam) and half 50 caliber machine gun bullet. That adds up to 100% awesomeness. Don’t forget to add the recipient’s initials. 7. Oak Barrel Mug, $56.95. 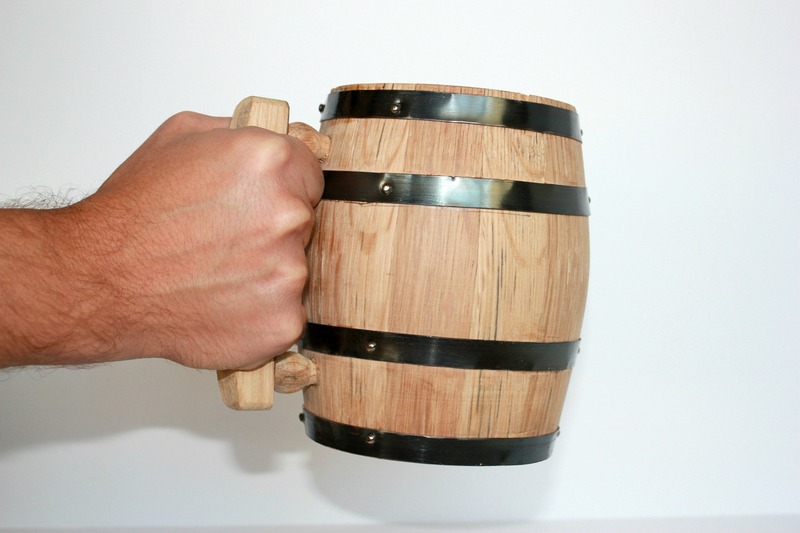 How cool is this oak mug made from an authentic bourbon barrel? Available in two sizes (1/2 liter and 1 liter), the mug can be used for chugging beer or even sipping soup. It can also serve as a distinctive display piece for a home bar, den or office. 8. 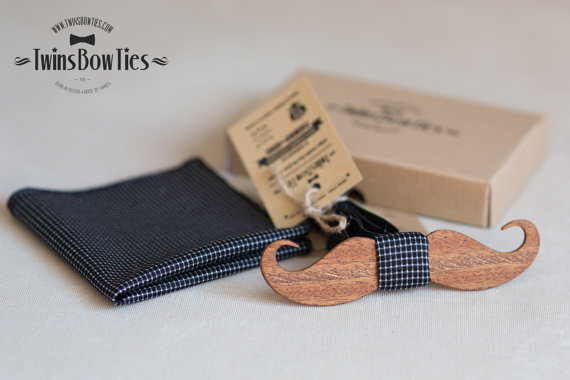 Wooden Mustache Bow Tie + Pocket Square Set, $49. Hunting for a gift that your boys can wear on the wedding day? These mustache bow ties from TwinsBowties are cool, stylish and very unique. You’ll also receive a pocket square that will help complete the group’s wedding day look. 9. Wooden Shot Glasses, $14.95. 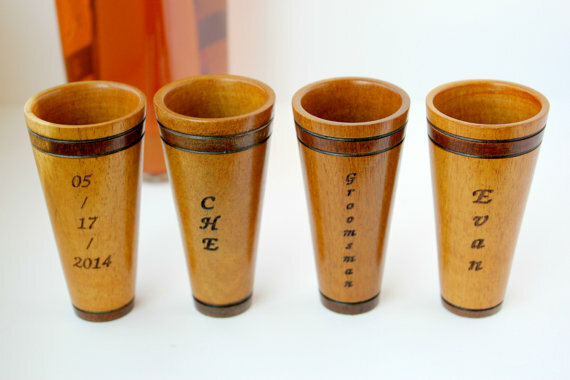 These cylindrical, handcrafted Mora Wood shot glasses are perfect for tippin’ a few back in style during the bachelor party or other pre-wedding outing. Better yet: They can be engraved with a name, date or set of initials to add a touch of customization. 10. Custom Fishing Lure, $16. There are few things in life more enjoyable than hitting the water, cracking open some cold ones and throwing in a line with your buds. 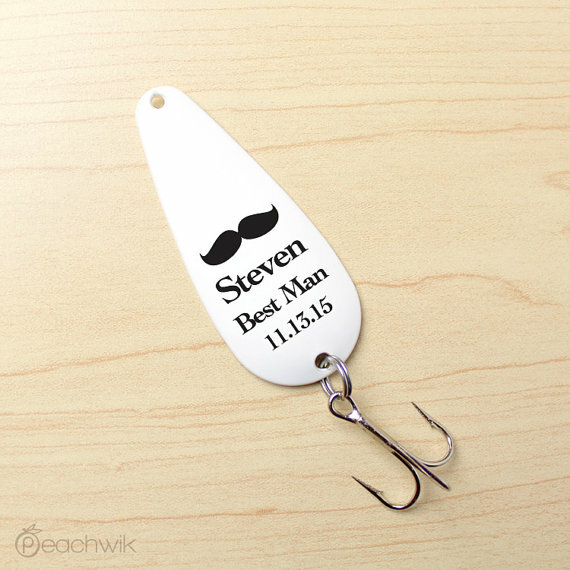 This custom fishing lure is personalized with a mustache and three lines of text. Just make sure the recipient knows how to tie a good knot. This is one lure you don’t want sitting at the bottom of the lake. You know your groomsmen better than we do. Which of the 10 gifts featured above would they like most? Let us know in the comment section below. 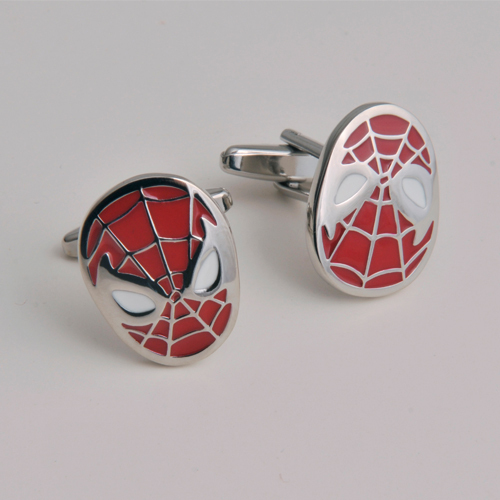 Spiderman Cufflinks – Gain all the powers of Spiderman without having to be bitten by a radioactive spider. This awesome cuff link set comes packaged in a special tin that can be personalized with the recipient’s name or initials. Click here to buy. 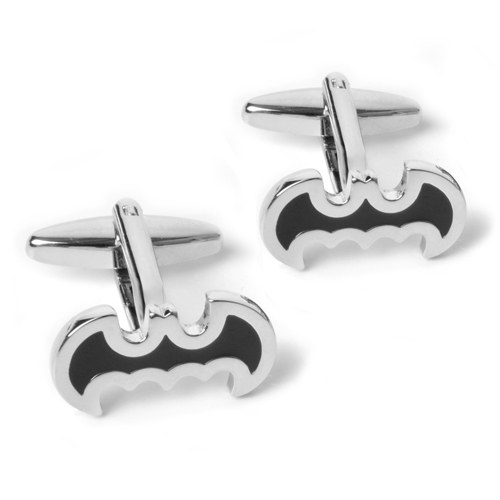 Batman Cufflinks- Has there ever been a better time to be a fan of Batman? Christopher Nolan’s films have done an amazing job of re-launching the world of The Caped Crusader. We can’t wait for next year’s The Dark Knight Rises! Click here to buy. Superman Cufflinks – On your wedding day, you’ll be the Man of Steel. 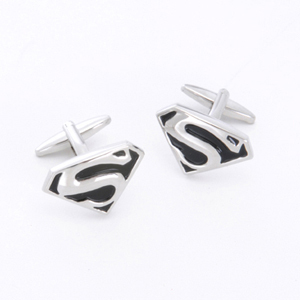 Show off with this set of Superman Cuff Links that will arrive in an engraved case. Click here to buy. Who’s your favorite super hero? Tell us and explain why in the comments section below. Why would a groomsman need a book? For reading? Nah, that’s boring and so last-century. To display on a shelf? Yea right; it’s more likely to end up buried in an attic or closet. No, we’re thinking of something a little more sneaky and sinister. 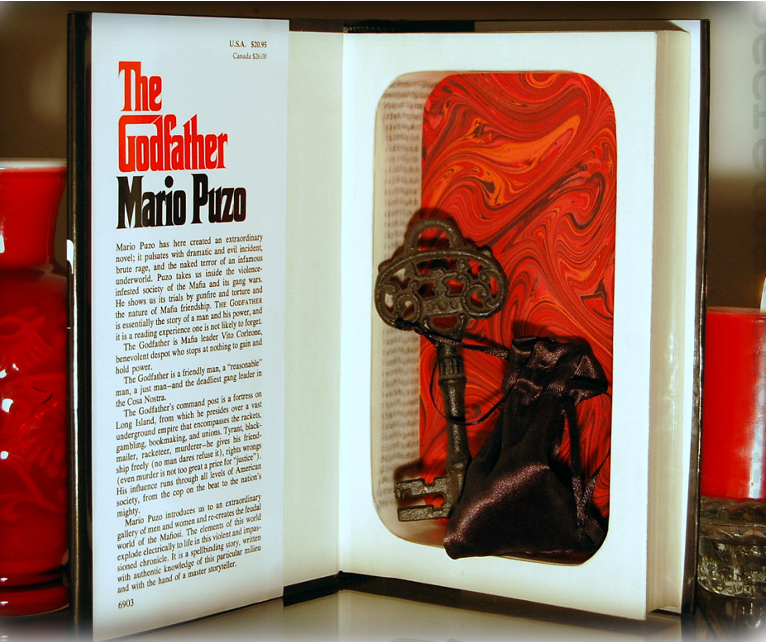 When it comes to groomsmen gifts, guys are always looking for memorable gift ideas that each groomsman will actually want to hold on to, which is why Secret Safe Books can be custom ordered. You can request specific favorite books from previously crafted titles that fit the personality of each member of the wedding party. Check out a list of available titles here. To order a set of Secret Safe Books for your groomsmen, click here, visit SecretSafeBooks.com, or e-mail kara@secretsafebooks.com. The books can be mailed worldwide with domestic shipping discounts available for purchases of three or more books. Which book would you hide your flask in? Post a comment below and let us know. 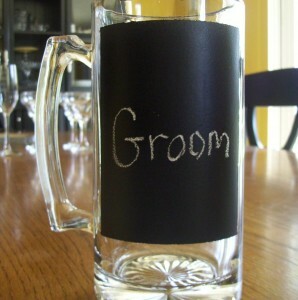 What do you think about the Chalkboard Beer Mug? 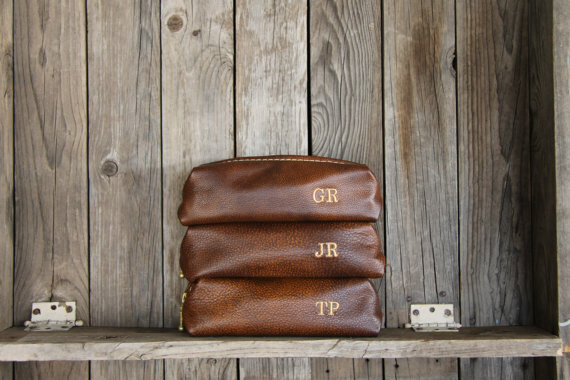 Would you consider giving one to your best man or a groomsman? It’s always so impressive when the guys come up with some brilliant unique find. It shows you’re thinking about the details that would make your wedding day creative and thoughtful. Yes, I’m looking out for you guys! 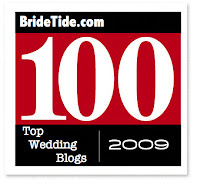 Gretchen Viles of MyWedding.com is a weekly guest contributor to the GroomsAdvice blog. She specializes in blogging about groom’s issues from a bride’s perspective. 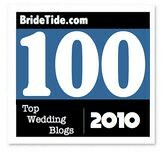 Founded in 2002, MyWedding.com has grown into the most comprehensive easy-to-use local wedding guide on the Internet. They recently launched a wedding ideas and trends content section that focuses on all aspects of wedding planning.